Crafters Companion > Blog > Paint Fusion by Sheena Douglass – available now! Paint Fusion by Sheena Douglass – available now! Since the launch of Sheena Douglass’ Paint Fusion range two weeks ago, you’ve been going crazy for the new technique – and we can’t blame you! 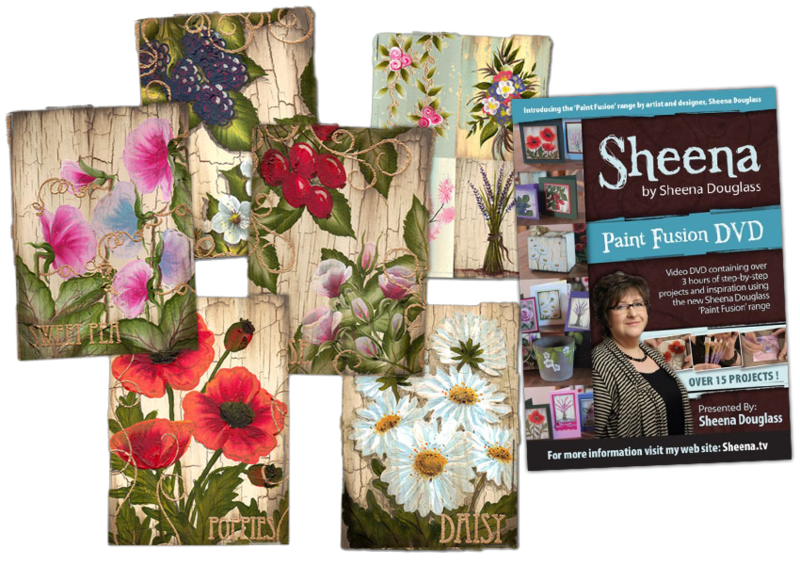 The beautiful results that you can achieve from the stamps and paints are just outstanding – but simple to create as well! We’re pleased to announce that the fantastic Paint Fusion range is now available on the Crafter’s Companion website! The range consists of six A6 size rubber stamps, each coming complete with an A5 laminated practise sheet plus a four page insert with inspirational samples, as well as the fabulous Paint Fusion DVD which includes over 3 hours of instruction and step-by-step tutorials to help get you started. The range is complemented by gorgeous Pebeo acrylic paint sets, mount-board shapes and high-quality Royal & Langnickel paintbrushes. This range is just flying out, so don’t miss this opportunity to try your hand at a new technique!